Nickel (Ni) substituted ZnO nanopowders were synthesized by simple and efficient co-precipitation method with zinc nitrate and nickel nitrate as the starting materials. Effect of Ni substitution on structural and photoluminescence properties of ZnO nanopowders has been studied. Structural characterization of the as prepared powders was performed with X-ray diffraction (XRD) studies. It was confirmed that all the powders were of zinc oxide having polycrystalline nature and possessing typical hexagonal wurtzite structure. Both lattice parameters a and c decreases from 3.257 to 3.214 Å and 5.217 to 5.156 Å, respectively with increase in Ni content from 0 to 10 wt % while the crystallite size calculated from the XRD data decreases from 29.8 to 14.2 nm, respectively. 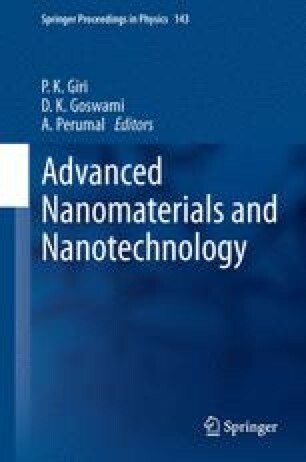 The effect of Ni substitution on the photoluminescent properties of ZnO nanopowders was also studied in order to exploit their possible application in nanoscale optoelectronic devices. The synthesized ZnO nanopowder samples showed a broad UV photoluminescence (PL) emission peak at 3.14 eV.